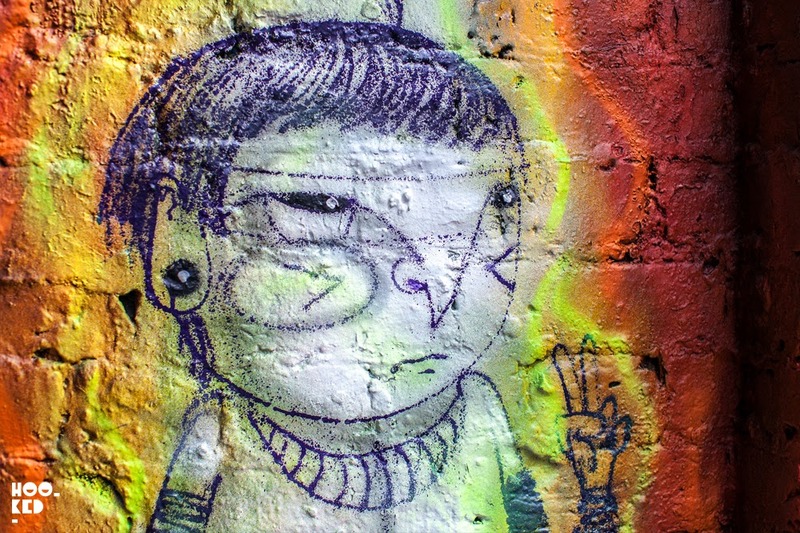 It's been some time since we've seen South American Fabio Oliveira, better known to most of us as Cranio, a graffiti/street artist from São Paulo. We have long been fans of the artists work often featuring his signature blue indigenous characters. 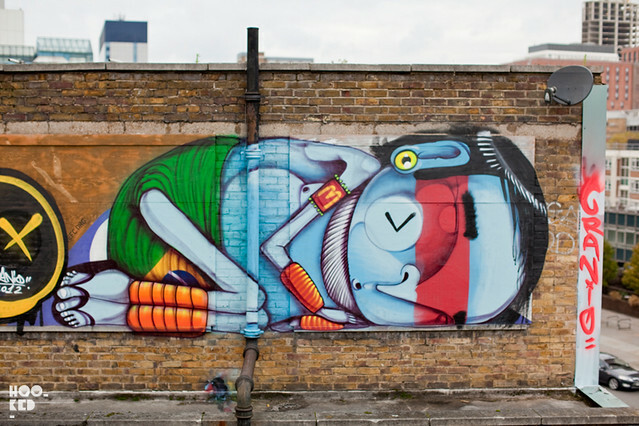 Hookedblog have caught up with Cranio on a number of occasions over the last few years when the artist has been in town and each trip to London has seen him painting a number of street pieces. Many of these Cranio works are still visible on the streets of London including his rooftop pieces on Bethnal Green Road (covered here) and another on the roof of the Red Gallery on Old Street (covered here) and pictured below. Other works still running include a mural on Rivington street, a super sized mural a little off the usual street art track in the shadows of Canary Wharf (covered here), and there are a few pieces in and around Camden to be discovered. Following his recent solo exhibition 'Amores' at Montana Gallery in Barcelona, Spain, Cranio travelled to France where he painted a monumental mural for the Street Art Festival in Evry, near to Paris as well as hitting up walls in Amsterdam with a number of new pieces. Now back in London, the artist has revisited this wall on Brick Lane for what we think is his third time, giving it a new lick of paint. Stay tuned for more in the coming days from Cranio. The rooftop piece at the Red Gallery visible from street level on Old Street, London. 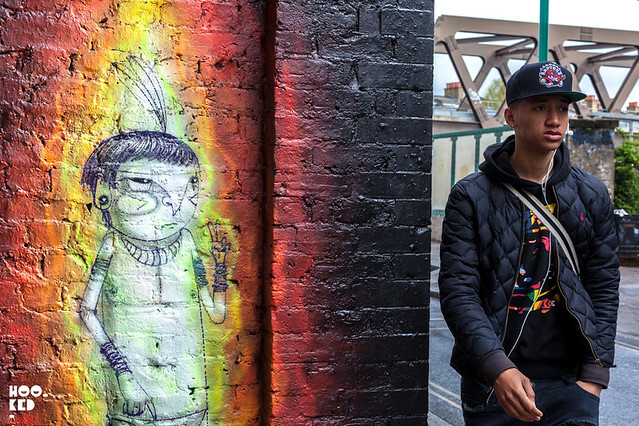 The first Brick Lane street mural at this spot from Cranio, as it looked in 2012. 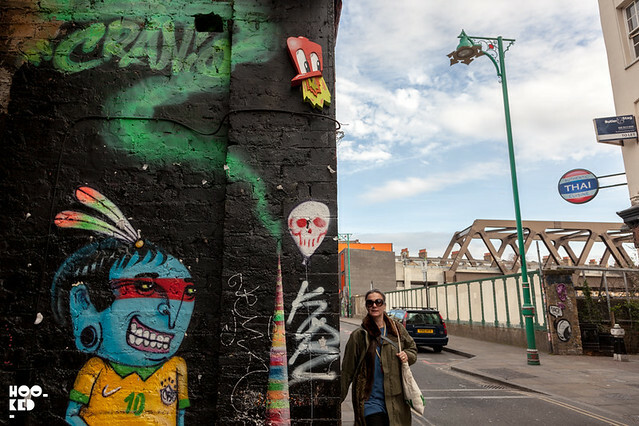 The wall was revisited by Cranio during the World Cup with a football themed update. 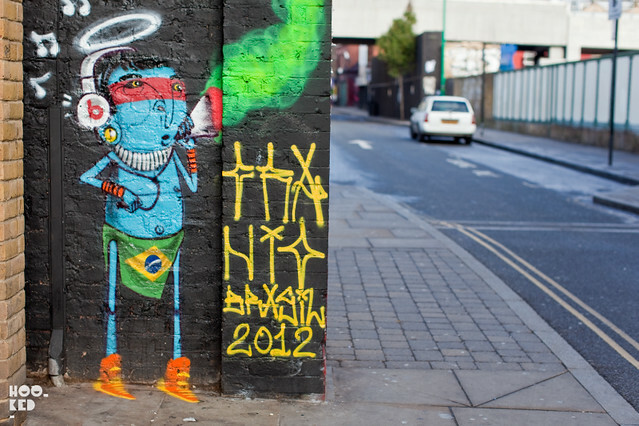 The latest update from Cranio on the wall on Brick Lane. We love seeing colour works like this too on the streets. If you make it to Shoreditch to check this mural be sure and take a stroll down to Fashion street just off Brick Lane where you will find another vibrant piece from Hunto.